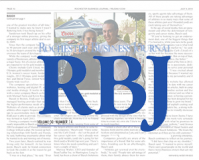 Basch Solutions was featured recently in the Rochester Business Journal. Check out the full article by clicking the PDF link in the article's content. .. Happy Birthday! : Basch Solutions turns 5! From the Desk of Justin Basch: I don't generally celebrate birthdays and anniversaries of anything aside from family and friends, but today is a great day. I am both humbled and extremely gratef..
First and foremost, if you haven’t read the blog article I wrote last summer called How Blogging can Grow Your Business Online, you need to read that and make sure you fully understand the imp..